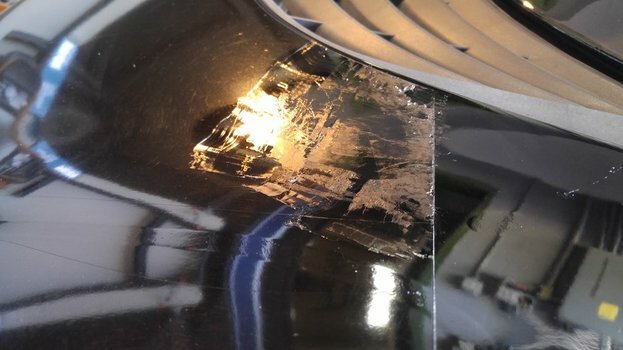 Older clear bras/paint protection films tend to crack and break down after time. Eventually you're going to need to remove and replace it. This article shows a Lotus Elise with a factory installed 3M film that Lotus calls starshield. If you talk to paint protection film installers, they'll tell you the old 3M material can be a real pain to remove. The Lotus Elise and Exige basically require paint protection film. The fronts are super low and every rogue, bouncing rock smashes into the hood. Then, there's the way the body curves on the sides of the car. The front wheels pick up road debris and throw it directly at the rear quarter panels. It's so old, it's no longer a solid, pliable plastic sheet. It's become brittle and cracked. Basically long past due to be replaced. If you scrape up enough of an edge to pull the material, it just cracks apart, even with some heat or steam, the product just comes apart only allowing you to pull tiny pieces of film up. And of course, the adhesive doesn't stick to the film at all - most of it stays on the paint. Basically the only way to remove it is with a whole bunch of time and labor. 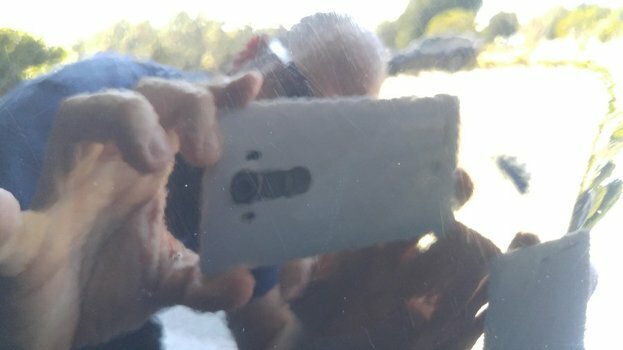 Keep in mind most modern paint protection films are much easier to remove. If you're installing a new film, be sure to ask your installer if they'll remove it, and when they suggest you replace it. 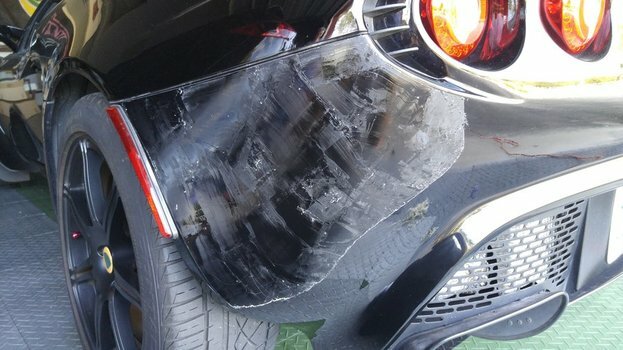 This process requires you to scrape against the paint surface, generally a huge no-no. 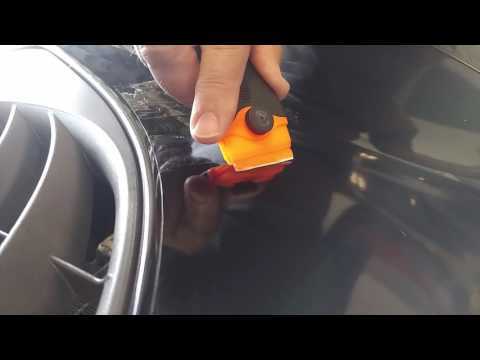 Make absolutely sure your plastic scraper edges are clean, soft, and free of dirt. It is very possible (and likely) you're paint will need some care after removing the film. We have a great article about machine polishing paint that may be a good follow up. A pack of basic microfiber towels go cheap, you'll throw them away. You're going to be wiping, rubbing, and scraping the paint's surface. Clean all dirt and dust off the vehicle to reduce the potential for scratches to occur. Paint scratches and melting plastic things are the two biggest dangers in this project. Use the utmost care and respect for the tools and paint finish. Take your time, slow and steady wins the race. 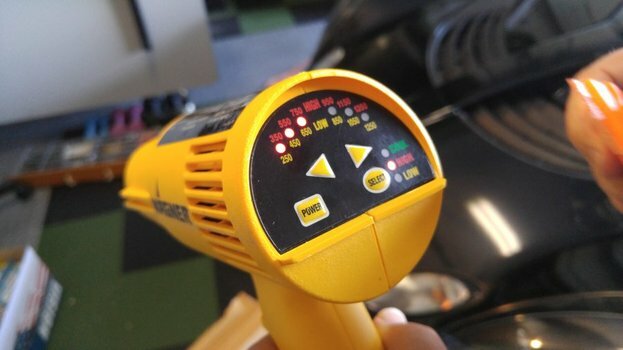 Get familiar with your heat gun. Learn how to handle a heat gun. These things output incredible heat that can melt, distort, and ignite all sort of things. Find a good place to sit the heat gun when you need both hands. 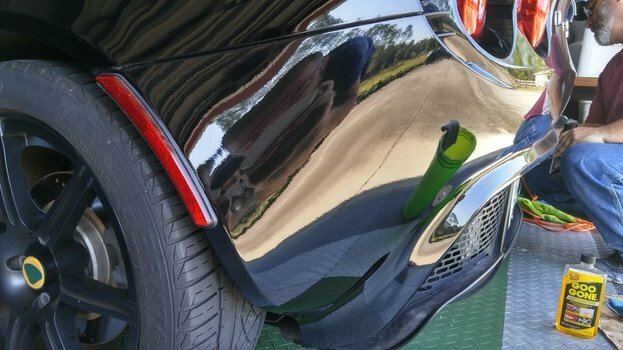 Make sure you have enough space that you can point it off to the side without melting the car or garbage can next to your work area. Experiment to find temperature setting that will just barely soften the 3m film. We ended up at 750 degrees (on high) with our Wagner Digital Heat Gun. Start at a lower temperature, and work your way up. Error on the side of caution to not overheat or melt anything! Carefully heat a small area, approx. 2 inches square, near one edge. Using your clean edged plastic scraper, attempt to scrape off the film (the adhesive won't come up with it). We had the best luck using these plastic razors listed in the parts list above. If it requires any force at all, you did not get it hot enough. When it is hot enough, the scraper will glide right through the material much like glue from a crafting hot glue gun. While heating, note how the film reacts, looking at the film at an angle, you'll notice the surface will give you visual cue when it's ready. Remove all of the film by heating a small area, and gliding off the gelled plastic film. Keep a rag handy to wipe the goopy film off your scraper, you need a clean plastic scraper edge for it to be effective. As your comfort level increases, you can remove larger and larger areas. The key factor keeping you from flying through the job is the buildup on the razor gets in the way. Here's another piece with the film removed, revealing the remaining adhesive. 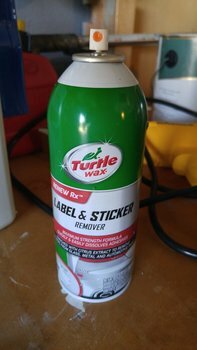 Wet out the adhesive with a layer of Turtle Wax Sticker Remover. 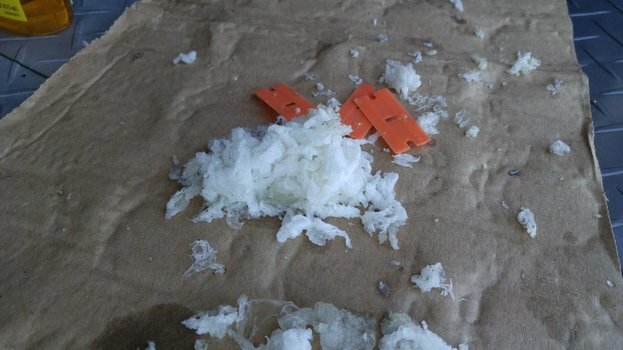 We tried several of the most common consumer products to remove the adhesive. They all sort of politely grease up the adhesive so that once it does come loose, it doesn't re-stick. The problem with this adhesive is it just plain doesn't move around. The Turtle wax spray changed it's physical properties, and it was the only product we found to have any effect. Patiently let it sit for 1 minute. Using a fresh, clean scraper, slowly and carefully scrape the adhesive surface to remove a layer of adhesive. This may require slightly more pressure then removing the film, but not a lot more. Don't bother attempting to dig under the adhesive, rather just shave the surface off. It seems the adhesive remover doesn't fully penetrate the adhesive, so you have to take it off a little at a time. Repeat steps 5, 6, and 7 until the adhesive all removed. Wash off the paint with water and soap. 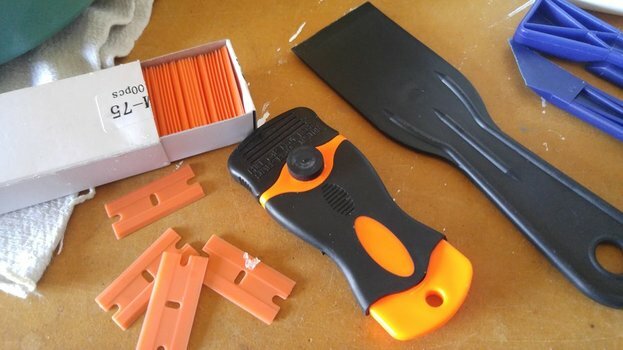 Clean off as much of the loose adhesive as you can. Use microfiber cloths in an attempt to keep the paint scratch free. You'll want to baby the fresh paint with a thorough cleaning and a fresh coat of wax. We tried a bunch of tools and chemicals to remove the film, a few didn't work too well. In the photo below, you can see some very minor finish scratches caused by those tools.